Although Jeremy Piven got a lot of flack for pulling out of his Broadway show citing "Mercury poisoning," I can assure anyone who's reading this that hes NOT kidding. If he ate ONLY fish as his sole source of protein for 20+ years then he's a prime candidate. I myself ate ONLY tuna as my source of protein for 30+ years. I had heart arythmia, chronic fatigue, joint pain, headaches, difficulty thinking clearly, hair loss and a variety of other symptoms. Check out the video of Piven on Letterman if you haven't already. What's the connection between tuna and mercury? Mercury is a natural element found in minute quantities in air, water, and all living things. Mercury can find its way into food sources through a number of channels, including natural recycling, burning of fossil fuels, and pollution. There has been increased concern about mercury in seafoods since the fall of 2002. Recently, the U.S. Food and Drug Administration (FDA) announced that it will be developing a new advisory on mercury for children and for women who are pregnant, nursing, or thinking of becoming pregnant. Several other organizations have issued warnings that fish such as tuna should not be consumed by this subset of the population. These warnings have caused unwarranted alarm about all seafoods and general confusion about what is safe to eat or not—and, among retailers, what to tell customers when they ask. It is hoped that this fact sheet will fill in some of the information gaps. Mercury exists in nature in two forms, inorganic and organic. It is the organic mercury methylmercury that concerns us here. Methylmercury binds to tissue and is the form found in fish. Some fish have more methylmercury than others, depending on their aquatic environment and where they stand in the food chain. Fish absorb mercury in their gills from their environment and from their food sources as they feed on other aquatic organisms. A general rule of thumb is that the larger the fish, the higher the level of methylmercury in its flesh. A very large bluefin tuna or swordfish will tend to have larger levels as the compound accumulates. Although all fish have trace amounts of methylmercury, most fish have less than 0.1 parts per million (ppm). Canada and the U.S. have established guide-lines for allowable levels of mercury content in fish and seafood products. The U.S. limit is 1.0 ppm while Canada Health guidelines allow a lesser amount, 0.5 ppm. Studies have shown that the highest levels of mercury are found in sharks, swordfish, tilefish, and king mackerel. The tuna issue is a complicated one. There is research showing that some large tunas, such as bluefin, can exceed the FDA limits. Part of the confusion is that, in the past, many of the reported results listed all tunas together, making no distinction among the species (albacore, skip-jack, bluefin, yellowfin, and so on). One can see tables in general publications such as Newsweek showing fresh-frozen tuna having 0.32 ppm, with no distinction among the different species. The range in the data is often very wide, for example, from 0.05 to 1.30 ppm, but it is not possible to differentiate between the species the way the data are reported. Therefore, a specific fishery, such as troll-caught West Coast albacore, is unfairly associated with other tuna species that might have higher levels of mercury. For example, a recent FDA study showed that canned albacore from common commercial brands had a higher average than canned “light tuna. This is, in part, because the albacore in common brands are larger fish caught in the open Pacific, whereas “light tuna is often the smaller skipjack species. 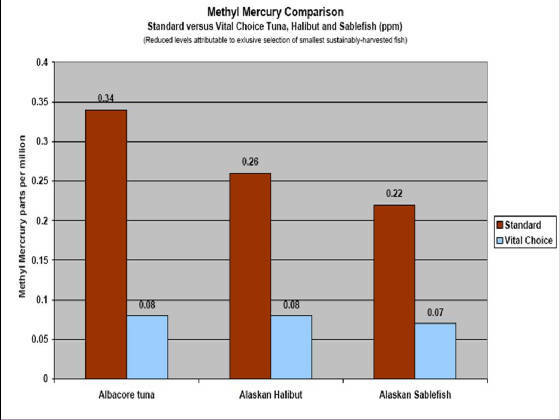 The good news is that several species in the Pacific Northwest have been shown to have low mercury levels. Research work with troll-caught West Coast albacore showed levels below FDA and Cana-dian guidelines, which makes sense since coastal troll-caught albacore is small (10 to 24 pounds) compared to other commercially caught tunas. Salmon is very low in mercury, as are sardines, flounder, shrimp, and oysters. There are ongoing research projects to better define the amounts of mercury in fish and determine mercury levels of many of the species off the Pacific Northwest and differ-ences that might occur in size and location. So, what do you tell your customers? For children and for women of child-bearing age, the FDA advisory will most likely state that it is safe to eat fish and shellfish twice a week and that one should always eat a variety of species. Some species, such as shark and swordfish, should be avoided. Buying and selling local-caught salmon, shrimp, flounder, and oysters is an easy choice and there is little mercury concern. Troll-caught albacore is safe under these guidelines and there is also good evidence that eating these species is very beneficial to our health. They are high in omega-3 fatty acids, and a diet of fish high in omega-3s has been shown to reduce the incidence of cardiovascular disease, improve mental health, and provide other health benefits. By Michael Morrissey, Director and Professor, Oregon State University Seafood Lab, Astoria, Oregon. Why is Alaska Seafood so superior? Alaska is fish country. For thousands of years, the fishes of Alaska’s seas and rivers have supported human use, from fisheries used by Alaska’s indigenous Native peoples since prehistoric times, to today’s modern seafood industry. Alaska is home to abundant stocks of many species of fish, and offers some of the cleanest marine, freshwater, and upland habitats in the world. Alaska’s human population density is among the lowest of any in the United States, and lower than most places in the world. Alaska has little heavy industry, and has strict regulations governing development activities, such as road building, mining, logging, and sewage treatment. This chart illustrates how superior wild Alaskan Vital Choice® albacore tuna is vs. typical standard brands. The level of methyl mercury is significantly below that of brands most people regularly consume.